Knorr Mashed Potato is an easy to prepare, high quality potato mash. The quality of our 100% sustainably grown potatoes is the key ingredient for this traditional side dish. Due to the dehydrated mixture of potato flakes and skimmed milk, Knorr Mashed Potato is the ideal gluten-free companion for steak and roasts. 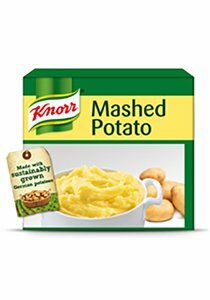 • Knorr Mashed Potato is also perfect for creating toppings for pies, fillings for croquettes, or even as an ingredient for soups. • Hassel free product in a busy hygienic kitchen.